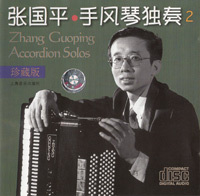 Zhang Guoping was born in 1960 and began learning to play the accordion when he was ten years old. It was perhaps inevitable that he chose to play accordion as his entire family, parents, brothers and sisters are all professional accordionists. At the age of fifteen, Zhang Guoping took the first step in his musical career by joining the Chinese Broadcasting Art Company. On November 26th 1983 he gave his first accordion recital in the Central Conservatory of music in Beijing. 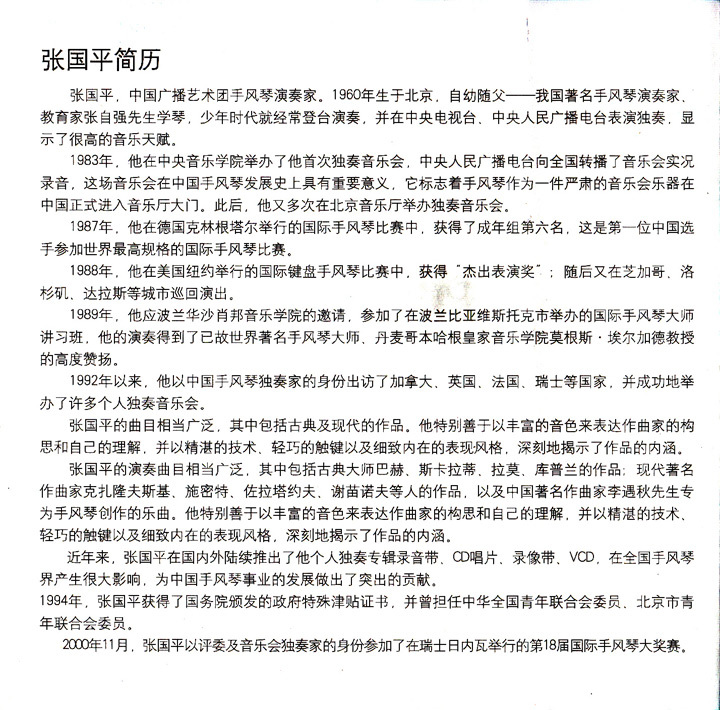 It was a great success and China Record Service published a record and cassette tape of his performance. At the 1987 Klingenthal International Accordion Competition (East Germany) Zhang Guoping was placed sixth and received high praise for his performance. He was the first Chinese accordionist to play in this important event in the international accordion calender. Zhang Guoping has performed in Germany, U.S.A., Canada, Poland, Switzerland adn France as well as appearances in China's Beijing Music Hall and other major city auditoriums. He has appeared regularly on Radio and television. "In my house in Copenhagen I have a beautiful Chinese Sheng, and I know from my friend, the world famous Chinese harmonica virtuoso, Cham Ber Huang, that this small reed instrument is very popular in China. Twenty years ago we concertized extensively together in American and Europe, and we also recorded gramaphone records, one of which was released in China. However I never heard anything about an existing accordeon culture in China, until Zhang Guoping quite unexpectedly turned up at the International Interpretation Accordion Seminar in Bialystok, Poland. In his concert he demonstrated a fine musical sense and good technique. His performance of new Chinese accordion music was extremely popular with the audience, which consisted almost exclusively of accordion professors, teachers and conservatories from countries such as DDR, Soviet Union, Holland, Belgium, Finland, West Germany, Poland, Yugoslavia, Austria, England and others." "In my own master classes during the two week seminar I has the pleasure of guiding Mr. Zhang Guoping musically and technically in both contemporary Scandinavian literature and Scarlatti Sonatas, and I was impressed by his sound and professional approach to this complicated music. 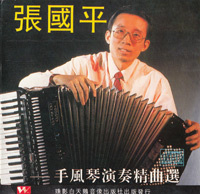 So I can safely state that Zhang Guoping is an excellent ambassador of Chinese accordion. I look forward to meeting him again some day and to exchange ideas and music, be it in Europe or perhaps his native China. A continued exchange of information undoubtedly may be highly valuable for the young Chinese accordion culture." signed Mogens Ellegaard, Professor, Royal Danish Academy of Music, Copenhagen, Denmark. 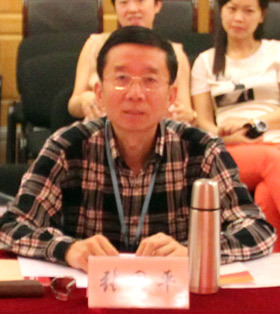 Professor Semionov, Professor of the Musical Pedagogical Institute of Gnessins in Moscow, whose work "Don Rhapsody" is perhaps one of his most popular and well known, endorses these comments saying "He (Zhang) makes strong impressions with his wonderful sense of rhythm, and brilliant technique."